Over the weekend I bought an old copy of The Reader's Digest Great World Atlas. Originally published in 1961, this was a second edition printed in 1975 (that's the gold foil embossed cover design above). I picked it up just thinking it might be handy to have in the house and it's funny, I've seen this book and similar atlases many many times, so many times, over years, that I wouldn't normally take much notice but flicking through it this time I was struck by what a monumental piece of graphic design is was. 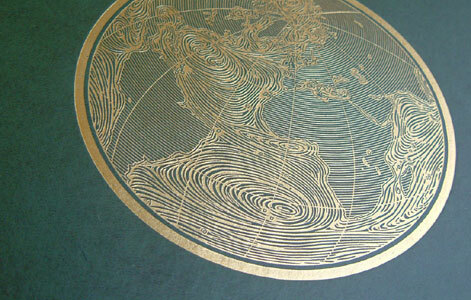 First, of course, comes the maps, starting with relief maps or "how our world would appear to an observer at a point some hundred miles above the Earth's surface". Then the really beautiful stuff: conventional maps perhaps, but viewed up close the minute type and line screened colour areas are irresistible. 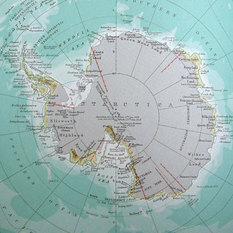 The last map in this section, of Antarctica, is startling, thanks to its geographic position, i.e. where lines of longitude converge, and its barren land mass. But it's Section Three, The World As We Know It, which is most fascinating. It's packed full of interesting facts about the planet and is lavishly illustrated. OK, it's all text book stuff but I wasn't paying much attention at school so now The Earth's Structure, Patterns of Climate, Life in the Sea, Bird Migration, The Spread of Mammals, Religions of the World and Human Migration since 1650 are all very interesting. Genius. I have an early 70s one in the attic. Beautiful stuff, and how the memory jogs! My Dad had/has this atlas (I'll have to ask him) and I remember flicking through it as a boy... much like you do first time you're on Google Earth - no apparent reason, just looking around. I once had a dreadful job interview at Reader's Digest. Many years ago, and not the worst by a long chalk. But it's funny how a bad interview can cloud your opinion about a whole organisation. Maybe I ought to post about it - and give the libel lawyers something to do. I picked one up at a thrift store and had the same reaction as you. The use of colour is also quite stunning. As a small boy in the mid 1970s I got a really deep paper cut on my thumb from my parents' copy of that atlas. Funnily enough there's a blood stain on page 31 of this copy! I've just called my parents: they've still got their copy. It would seem I'm not the only victim of this treacherous tome. It lures you in with its seductive information graphics on 'Whale And Eel Migrations' and the like, then bam! Dario Argento all over the Dralon. Beautiful images with very striking covers. 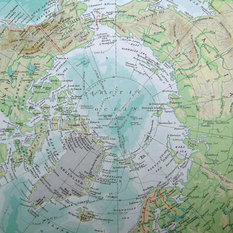 the atlas that you have put on the Internet is the same atlas as i have got so if you find any interesting things in an atlas just tweet me on twitter or find me on Facebook.